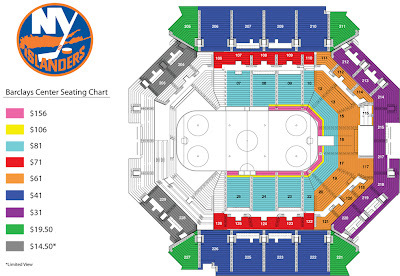 The Barclays Center had recently put this seating chart on their website. This layout is completely different that the Ticketmaster one and what I feared when I read the New York Times article several weeks ago. I cannot see a professional hockey team playing permanently in a horseshoe layout. If this is indeed the hockey layout for the Barclays Center the Islanders best option in New York has just taken a major hit in my mind. Dude, this is not good. We have to wait until October 2nd to see what it looks like and what the sight lines truly are. If the Isles move there they probably have a plan, but that chart is awful. Architects have a great seat plan in his mind, he done something new to the People's for Barclays Center. After fully constructed, it make history in the amazing building.